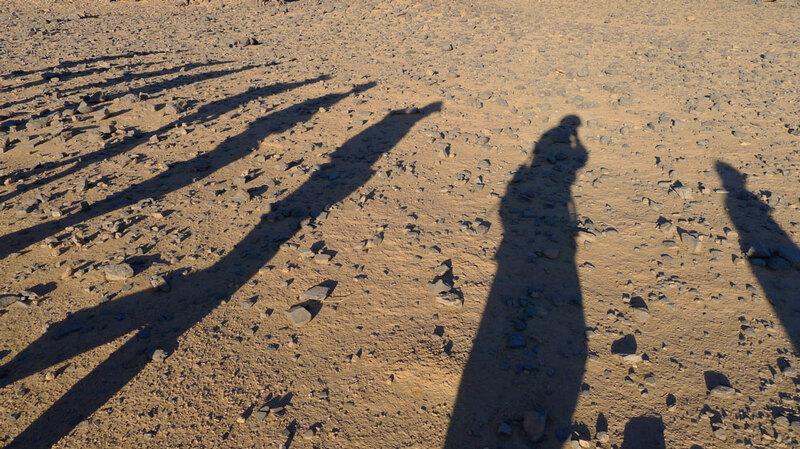 I was back in Tamanrasset, this time with a small group of camel trekkers. Year by year it gets more difficult to travel out here and a few weeks earlier Algeria cancelled all tourist visas to the desert– most probably due to weapons slipping out of Libya west towards Mali where some kind of rebellion has already broken out. As a result three missed out and only 7 got visas: 3 Americans: Diane and Steve from Tuscon and Patrick (later just ‘Rick’) from NYC, plus Rob from Bermuda, Hannah from Alderney, Rob from Bristol and Mike from Staffs who’d been on a 2006 Gilf trip I’d led for a tour agency. Right: Camel trekking ebook. It’s nice to drive cars and ride bikes in the desert, but these days that can feel rather conspicuous as you come down from the north. With camels you slip into Tam on the midnight plane from Algiers, and 24 hours later are out in the sticks, largely unnoticed. Any anxieties I had about the ‘Grand Sud’ being closed and us getting stuck- or sent back from Tam came to nothing. And I knew once we were out bush all would be fine. I’d originally planned a meaty 4-week trek from Tam to Djanet, but decided mid-ye that left us exposed along the Niger border where an Italian woman had been grabbed a year ago. She’s now one of 12 Europeans (as well as local police and others) in the hands of AQIM in north Mali. I’ve just started reading this book about the history behind these events and if nothing else, it underlines how dire it would to be dragged around the oueds of northern Mali for months at a time, suffering injuries and other ailments, with no shelter, terrible food and dirty water. 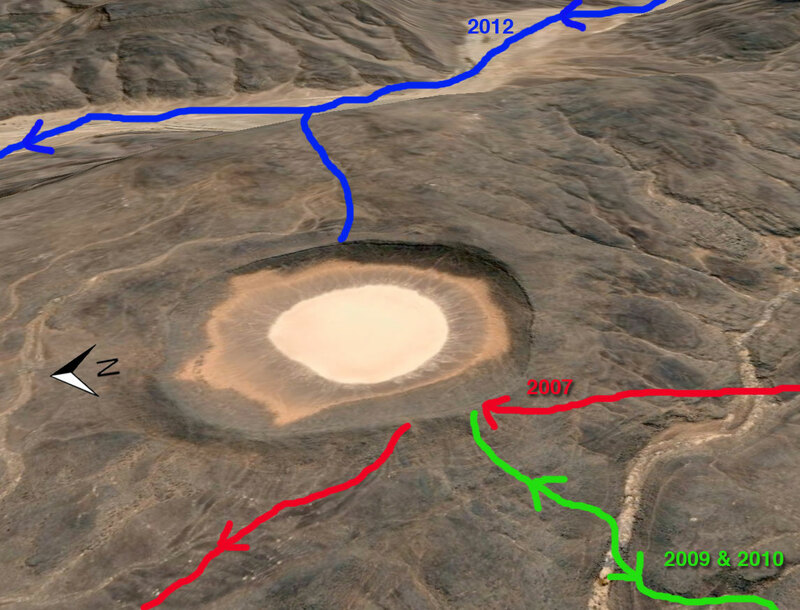 So, with Tam-Djanet a bit sketchy, the plan boiled down to repeating the reliable Amguid Crater trek I’d done a couple of times over the years for Simoon, then drive back down to the Hoggar and spend a week walking up to Assekrem and back (report on that later). I was using a new agency this time, Ben Kada, an established operator recommended by a friend of a friend and so, along with all the other unknowns, I was hoping they were going to deliver – which in the end they did better than I’d expected. Last November a fake guide who’d infiltrated a well-known agency in Tam to set up a kidnap had been sent down, so it’s hard not to be a little paranoid these days, even if the Algerian security services are on it. Next evening ee arrived at the same camp south of Arak (left) which we’d used on the recce tour in 2007 with Simoon. The first day kicked off a stiff climb around midday which had been tough on the fully loaded camels, but this time our caravan managed fine. 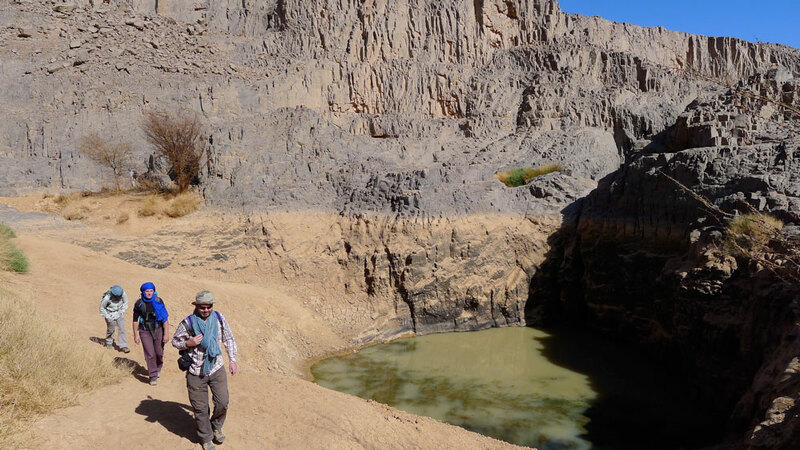 New Year’s Day followed, a spectacular amble through the box canyons of Tissadout, with lunch under a lone tree, a guelta swim and a rock art cave all ending at a great camp spot in the Adjror valley (home of Beetle guelta; these names established on the 2007 recce). Here we met the only other tourists in Algeria who were taking a two-weeker out of Arak. There followed a long haul to Igharghar valley, past the Haribo Tree, the Lunch Cave and the desert mosque, before diverting to a deep slot canyon and tombs which I’d missed on previous visits. Interestingly the deep cleft (left) is actually the river which breaks out through the gap in the ranges at Tadjemout, where we’ve started the tour on previous occasions. Once at camp I got rather lost in the dark while looking for firewood, returning to the camp from the opposite direction, but no one seemed to notice. 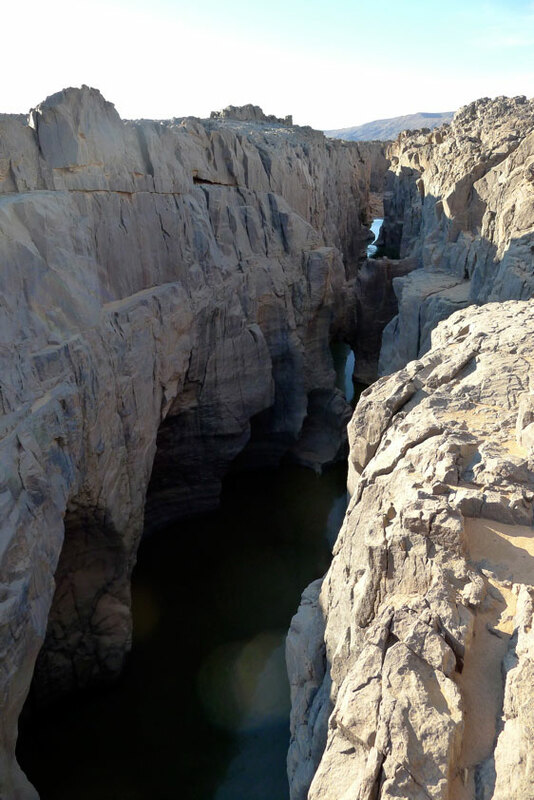 Next day I asked to Mohamed, our genial 72-year old guide, to visit the impressive three-tiered gueltas (rain-fed waterhole) we’d lunched at in 2007, but which had been skipped by subsequent guides. On the way there ‘Rick’ lost us while engrossed in the manual of his new Nikon Tankbuster, but did the right thing by getting onto high ground and was back on our trail by the time Moh had backtracked to find him. The same had happened to me hereabouts a tour or two ago when I’d stopped off and ended up chasing half-burned toilet paper in the breeze. Now Rick also knew that chilling feeling when you lose sight of the group, any trace of their tracks, and haven’t got a clue which way is up. As it happens the many tiered gueltas of Tin Karabatine were very low on water – as were many other rock pools in the region this year – but we managed to launder and wash anyway, while Moh instructed us to follow the canyon’s right rim upstream for 30 minutes to meet him and Tayeb the cook with the lunch camel later, in the valley above. It seemed a bit of a leap of faith, but we passed the test and met up close to the ever-serendipitous acacia which crops up at these times. Later on Tayeb was similarly tested by Mohamed, with less success. I knew well that the afternoon ahead was one of the nicest stages of the walk, made all the better by spotting a galloping mouflon (barbary sheep) as big as a donkey, as well as cheetah tracks (right), before we wound our way through the sandy outcrops down to woodless Camp IV. 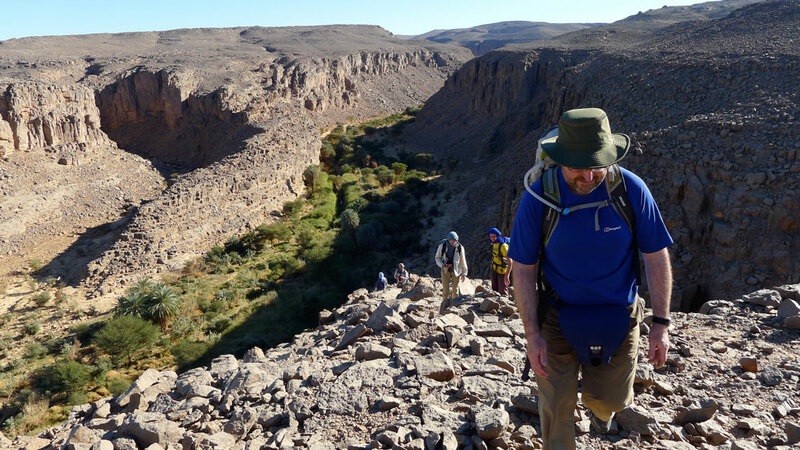 Next day was another long walk, 25km over to Tahaft; down into the big valley with a lazy lunch under a thorn-free tamarisk while the crew filled up from the soak. As on previous walks, we staggered in as the sun was setting behind us but very soon Tayeb had the tea and biscuits laid out while we waited for dinner. Up till that day, as with all that followed, there was very little wind until maybe the late afternoon which kept things warm, though it dropped to near-freezing most nights, and sometimes below. where birds twittered and jackal tracks set hard in the mud. We heard their yelps on a few nights, but I’ve never actually seen one out in the desert. Along the camel trails you’ll regularly find stone slabs laid up into conical ‘goat holders’ to protect them from the overnight jackals. a ‘keyhole tomb’ a couple of minutes from camp (above left), another 700 metres away which we passed close by later, but the strikingly huge antenna tomb (right, on GE) I led us to with the GPS was so big it was hard to visualise at ground level. Following another swim at a big guelta, we failed to meet up with Tayeb and the lunch camel. Tayeb was from Tazrouk down in the Hoggar and this was his first visit to the Immidir which Mohamed and his aged crew, Halil and Ahmed, knew well. So it was a bit of a reach asking him to meet us up ahead in a creek he’d never seen. We zig-zagged around while Moh tried to pick up the trail and at one point I strolled right across another huge keyhole tomb. Eventually Mohamed found fresh tracks and around 3pm we spotted Tayeb sat patiently alongside an acacia-lined oued. Ravenous by now, he got an unfair bollocking while we tucked into the heaped platters of salad which Tayeb prepared for us daily. 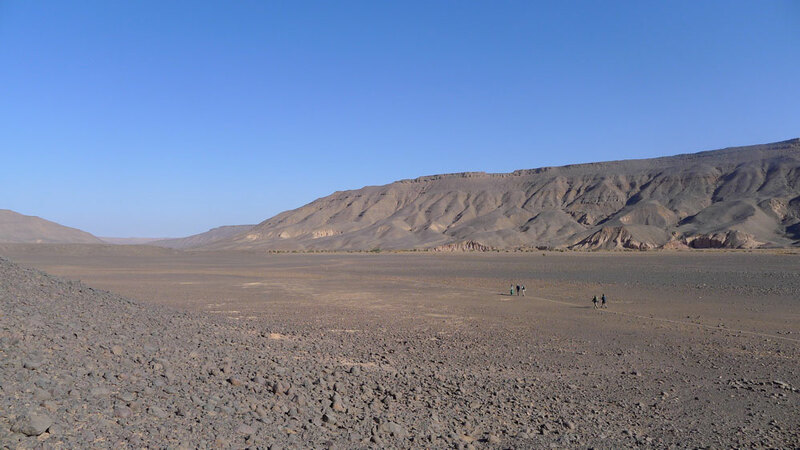 Moh had suggested that to get to the crater we take the next oued east after Tissadert, the Oued Taferekrak (according to the IGN map, below). Approaching the crater from this side was something I’d wanted to try for a while as the site lies just 500 metres from the canyon rim and ends up at the interesting Aguelman Rahla, surrounded by more pre-islamic tombs as well as dunes. 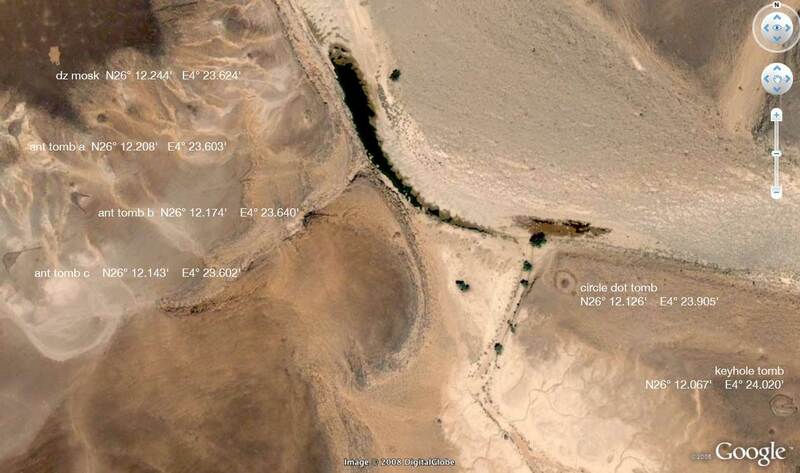 This also happened to be along the approach route to the crater we’d planned on Desert Riders back in 2003, going as far as leaving a fuel and water cache at Foum el Mahek gap to the east a year earlier (see map, right). That trip did not end so well, but having now walked up it, I’m not so sure riding the lardy Honda XRLs would have been at all easy up here. After a light overnight freeze, we set off up the wide canyon (left) and as expected, met some goat nomads who agreed to sell us an animal for a hefty €75. It had been the same price last year, but down in the Hoggar I was later quoted €50. Still, for a tenner each we ate well for three days and the crew got an unexpected treat too. 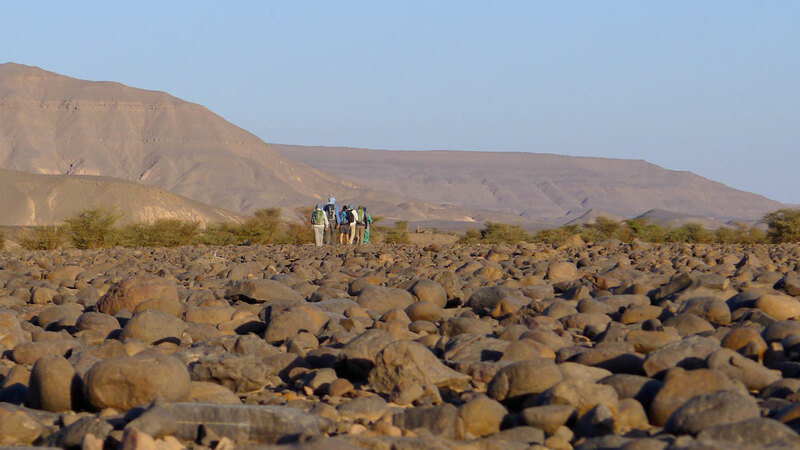 So, while the old men and Tayeb prepared to chop up the goat, we set off for the crater up the steep canyonside (right) with Salah, Mohamed’s 18-year-old son. After just an hour of huffing and puffing we looked down onto the crater (below), since sullied with stone-stencilled graffiti. 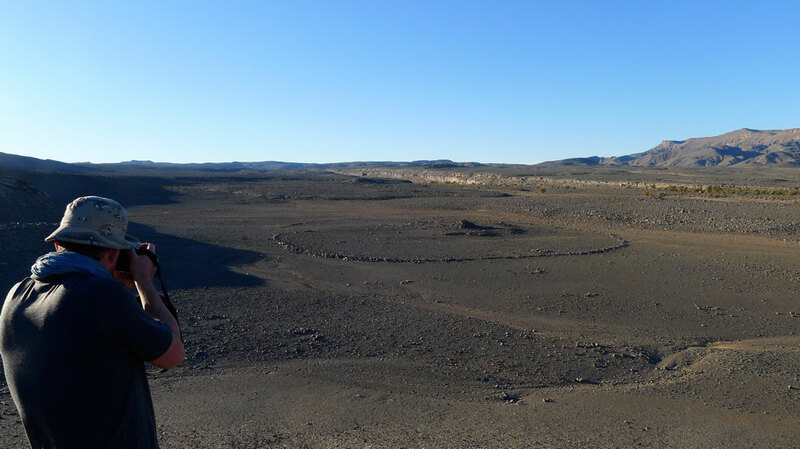 Some, including myself, thought it should be obliterated to return the crater (left) to its natural form, but as some of it was clearly the work of Algerians from Ghardaia, others argued that, as foreigners, it was not our place to be meddling with local ‘Kilroys’ wanting to lift their leg on the place. And at least the loose stones were not permanent. Maybe someone else will do the right thing. A dust haze had drifted up the valley that day, reminding me of the near disaster (from a visibility PoV) we’d had on the Eclipse tour in Niger back in 2006. Undeterred, Salah leapt back down to the canyon floor like a rubber gazelle where sure enough, a fresh goat stew was bubbling on the coals. The following day we emerged from the Tafrakerk canyon at Aguelmam Rahla guelta (right) where we were in a little too much of a rush to wash off the dust of several days, much to the displeasure of Mohamed. He was quite right, we should have filled up and taken a bucket elsewhere, this waterhole is a key point for nomads topping off their goats prior to collection by Arab traders coming in from In Salah, two days drive northwest. 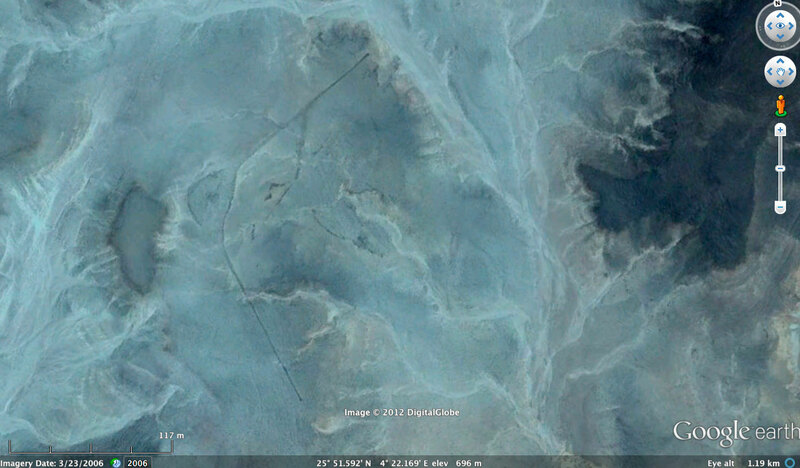 A mile away, the terminal dune of the Erg Teganet (right) made a great backdrop to our camp as well as a challenge for some next morning, while I wandered around looking for the tombs I recalled seeing clearly on Google Earth a while back (left). More on tombs here. After lunch we continued for half a day up the sandy Teganet oued (right) in the direction of Bir Outene at around 200km (see map). 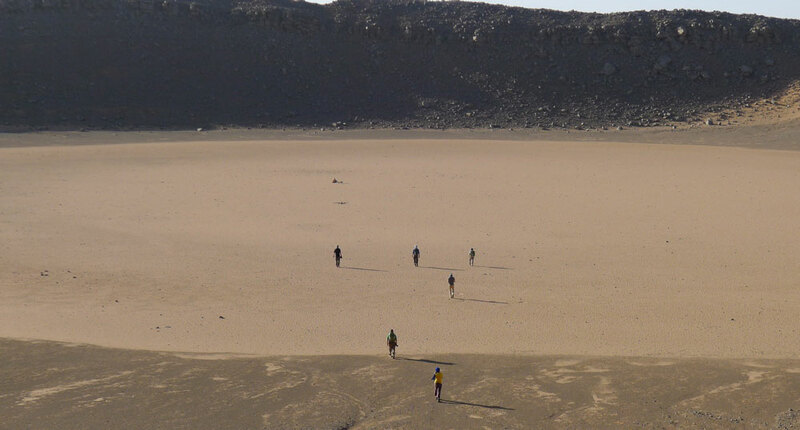 Here we had a day off waiting for the cars to arrive, as we’d saved a day taking the new route to the crater. We sat around, moving with the shade while reading our books or Kindles until the late afternoon brought the distinctive hum of 4WDs churning up the river bed in low range. Too late to pack up now, one of the drivers had a guitar and later that evening around the fire we listened to him and Mohamed drumming on a plastic water can. Then as the sands sucked in the cold we headed for our dispersed camps. It was an early start next morning for the long run to Mehajibat dunes and another day’s drive down the TSH to our Hoggar base camp. More about that here. Ahmed, Rob, Mike, Hannah, Diane, Tayeb, Loukmane, Said. 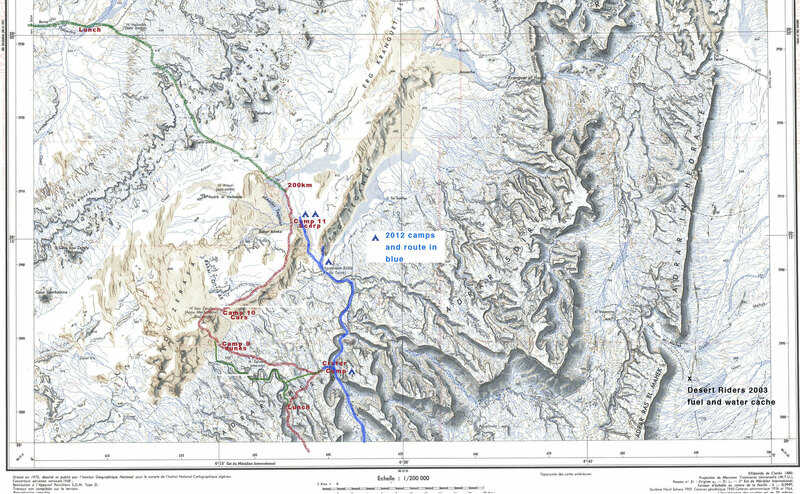 Tam-based Ben Kada agency had never run- or probably even heard of the crater route before, so I presume they took it upon themselves to travel up to Arak, track down Mohamed and his crew and ascertain that they could lay on the gear and knew the way. Ben Kada drivers dropped us off with the caravan and picked us up 11 days later, leaving it to the Arak guys to do the job. 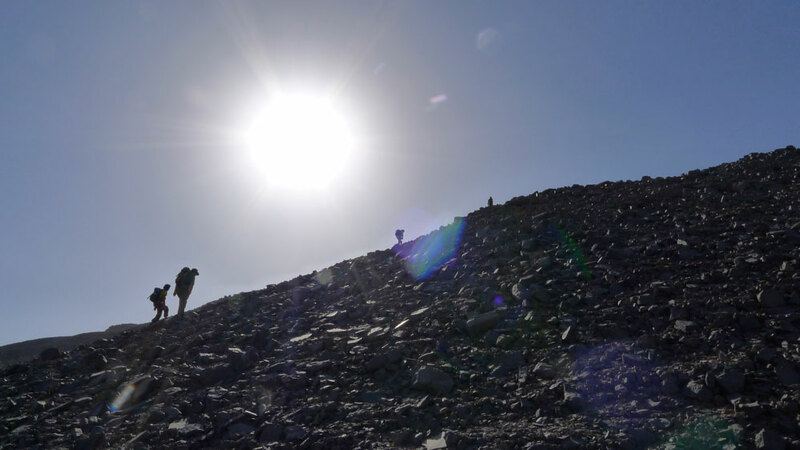 We ate around 7.30, just around dawn and walked between 15 and 25km a day (10-15 miles), which was plenty given the terrain at times, although lunches were often 2 hours long. Most of the time we did not travel with the caravan and often took detours which the camels did not or need not follow. 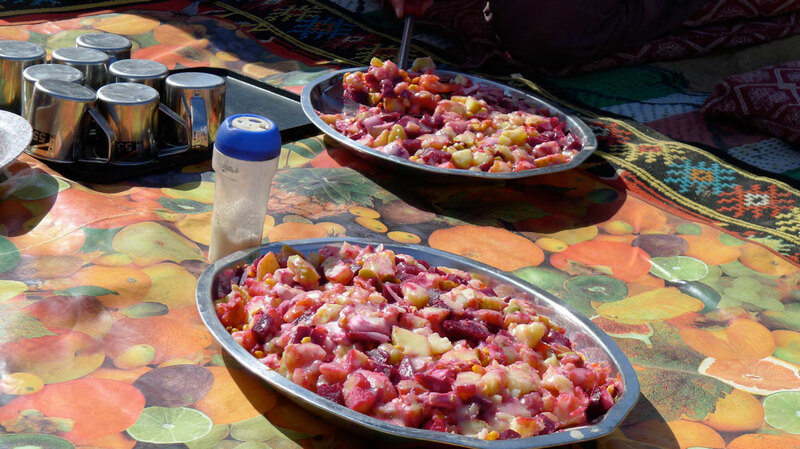 Sometimes we travelled with the kitchen camel and Tayeb the cook who prepared lunch, very often the best meal of the day. Breakfast was lean: tea or coffee, bread (baguettes or tagela), a solid block of marg, jam and Vache. As suggested beforehand, a couple BYO muesli or instant porridge. Once we had pancakes or French toast (eggy bread) or omlettes. Many carried day snacks, though I mostly went without as I had some weight to spare but was pretty hungry at most meals. 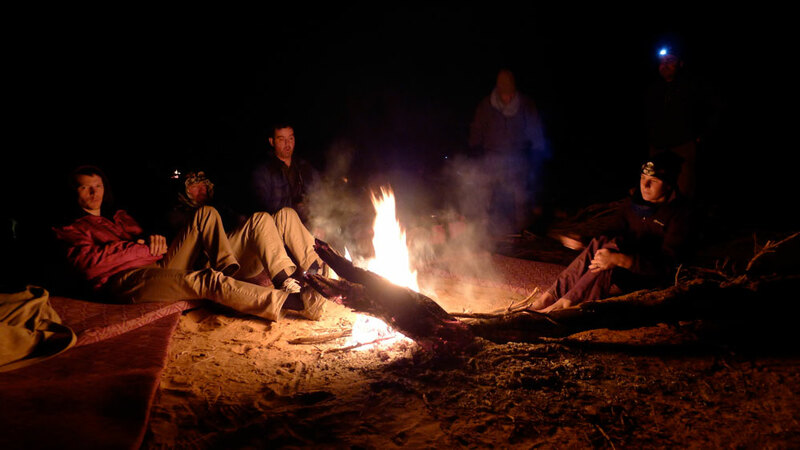 Hot drinks, peanuts and biscuits were laid out soon after we arrived at the camp – most welcome – and dinner was ready 2 hours later: soup followed by a muttony stew, sometimes with pasta or cous cous or rice or bread, plus dates or oranges – and glasses of tea later. Most were asleep by 10pm. 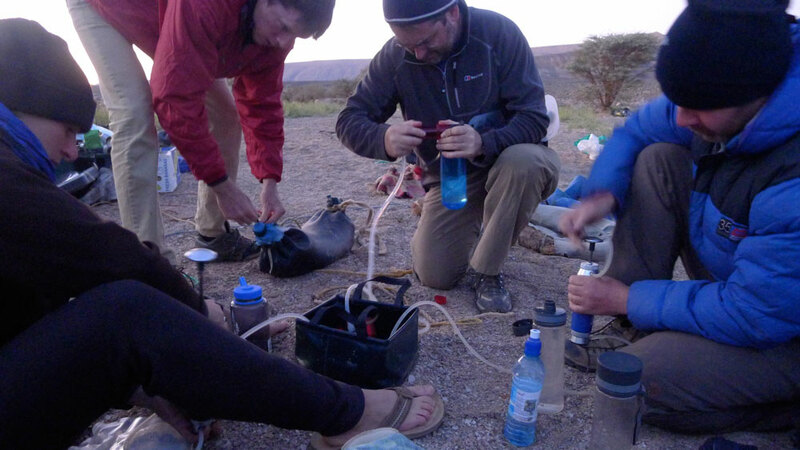 Once water was taken from gueltas we filtered, though we all agreed it was more to get rid of unsightly sediment than microbes which might make us ill. We drunk enough untreated water from other sources and no one got ill. The sediment makes filters clog up within a litre or two so the uncleanable ‘squeeze bottle’ type got blocked early on, while the cleanable Katadyn and MSR ceramic core jobbies carried on working with regular cleaning. Most found it got pretty cold around 6am: the mats supplied were pretty thin but once I recalled we had them, the extra blankets laid on were a great help with warmth (under or over). The cook spotted one small, harmless snake on the trail which he killed without thought. 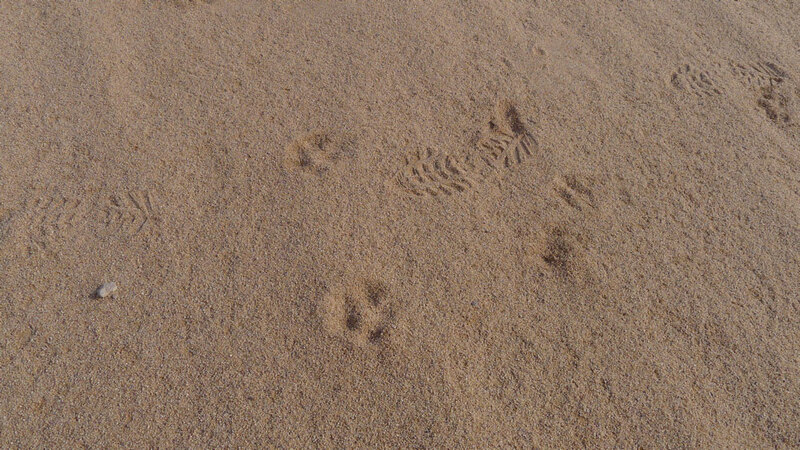 Some were surprised by this, but desert dwellers have a different attitude to these and scorpions (none seen). 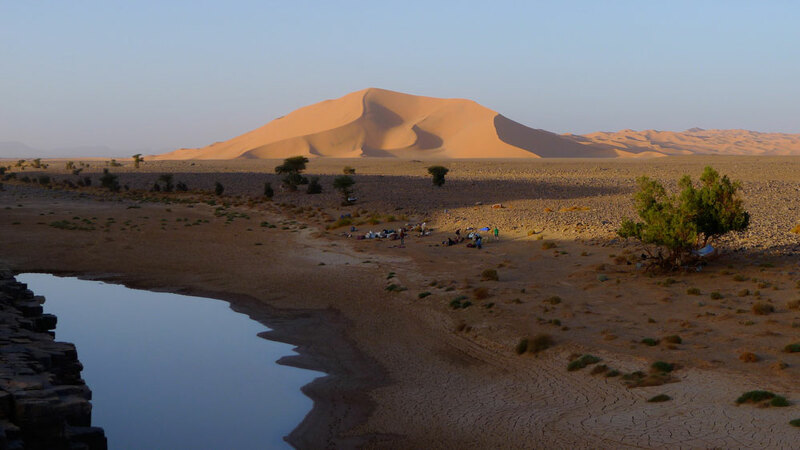 This entry was posted in Desert Babbles (blog) and tagged aguelmam rahla, Algerian sahara, amguid crater, cheetah in sahara, chris scott, immidir, Oued Taferekrak, sahara camel trek, sahara overland on January 24, 2014 by Chris S.